.. must come to an end. Time for Frankie to head back home, school starts later this week. We did take some time for the last family day of the year. 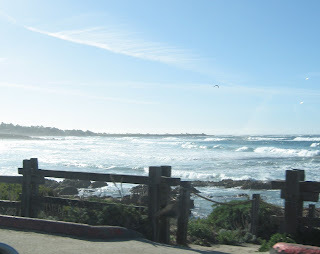 In contrast to the gloomy day here at home, the coast was beautiful.. it was so sunny it hurt your eyes to look out across the waves! The water and sky were both the bluest I've seen in a long time. There were a lot of people out walking, running, biking.. JUST OUT. The air was crisp and fresh and I think it was almost 60 degrees out. It was a beautiful day. Got to see the pillows in action! We hung up some new pictures and Bret took care of some electronic stuff. We had a nice lunch out. Then we hit the road. Came home and moved my fabrics back onto Frankie's bed again. 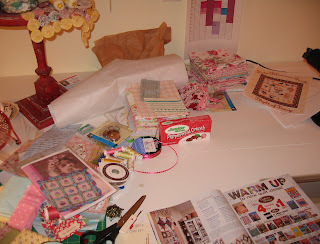 I have room to sew! 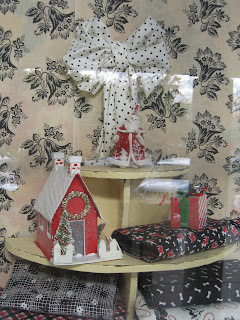 Hope to do some work in my sewing room tomorrow. Bret has the day off so we want to get some little chores done and then settle in for the night. No bright lights and parties for us! We're just a couple of homebodies! 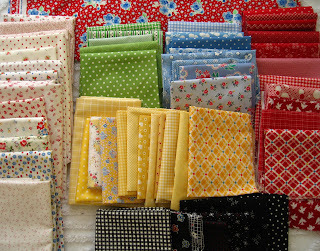 I've piled up my fabrics for block two of my Flight of Fancy quilt. The next block is the lower single bird and the half square triangles. No blacks here in this pile, but I have selected my blacks. You can see a bit of them here. I was lucky to find a couple of fat eights of a black with red dot at the shop, it was from one of last years Moda Christmas lines I believe. Phew. I think its going to be a great wing. I'll use solid black for the birds, and prints for the wings. 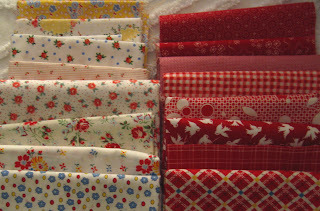 Frankie is home still, so I probably won't sew, but it was fun to collect up the fabrics. It's a cheerful project. And it's time to get back to work! Hope everyone has a great post celebration day. You know the calm, the one in the eye of the storm? That's what I feel like I'm having. There are things to do but we're just enjoying our time and if they don't get done, they don't get done. Frankie's home and we all, yes ALL went to Daiso in Union City on Saturday. Kirstin told me there are new more local locations, so for fun we went. Bret even. It was great. Kirstin, it doesn't seem as big or as good as the Daly City store, but it's been a while. It's true, our holiday isn't as pretty as holiday's past, but we're enjoying it so much this time. Well I'm enjoying it, I think Bret is going to miss the hosting of Christmas at our house, but his mother has graciously agreed to have it at her clean well organized house. And I'm grateful. Totally. I'll be bringing a big chunk of the food so I'm hoping I haven't put her out too much. Today is the last minute day, but not at the furious pace we'd be last minuting if we'd been having everyone over. Lots more laughing and enjoying for us, less sniping and griping. It's a freaky change, but we like it! I've been a big baby the past couple of days, I had a bit of the flu. I'm grateful that my hands on mom days are over so I can indulge myself in bed rest if I want. And so after just a couple of days I'm back. I'm not going to lie and say it wasn't great to just stay in bed though. 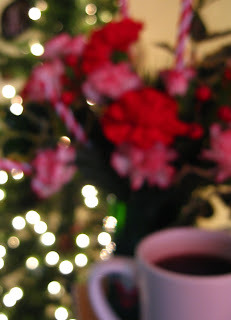 Thank goodness I'm up and back at the computer, I have emails and ohmygosh so many blog postings to catch up on. And speaking of blog postings, hop on over to Holly's blog and check out the little quilt I made for her 12 Bears of Christmas Project! I'm thrilled to have been invited to participate! Guess I better get cracking to face the day. HAPPY HAPPY peoples! It was a busy weekend, doing what? I don't even remember, it's all a blur. Getting closer and closer to Christmas so the pickin's will be slim around here... happy happy people, now I'm off to work. 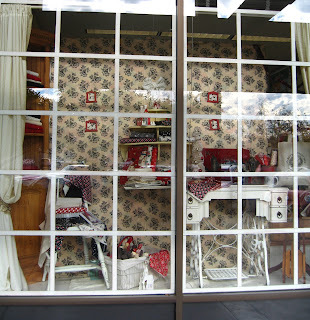 Leslie turns the window into a Christmas Sewing Room. Sweet! I wish there was a time with less glare so you could catch the small details. I found some perfectly perfect things online and didn't have to go to the mall after all! How perfectly perfect that made my day. It was a fun day filled with chatting with my favorite delightful daughter, some emailing with my peeps and then some Target shopping. I love Target, love Love LOVE Target. I know I shouldn't. But I do. I love all their fun clothes and believe me if only Target had some fun clothes down on the plus size end of the clothing aisle I'd be a happy camper.. Well not happy enough to actually go camping but I think just about all of you know what I mean. 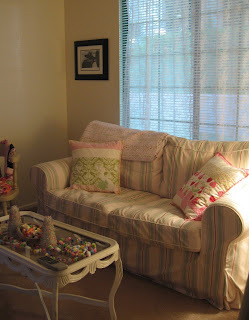 And now to the sewing portion of the blog. Do you love it? Does this seem like the perfectly perfect pair of pears to you? I does to me. Now I can walk by the room and find month one done. And The Pillow. 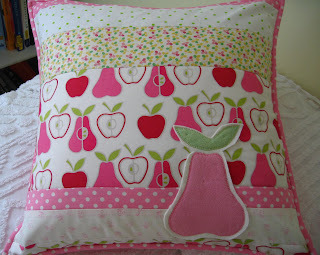 I haven't forgotten you my perfect pink pillowly friend. Tra la, off to work. Happy Tuesday sweet peoples! Hope the day finds you well. It's a sunny day here in my neck of the proverbial woods and I've basked in it.. the sunshine and the Tuesdayishness of it. 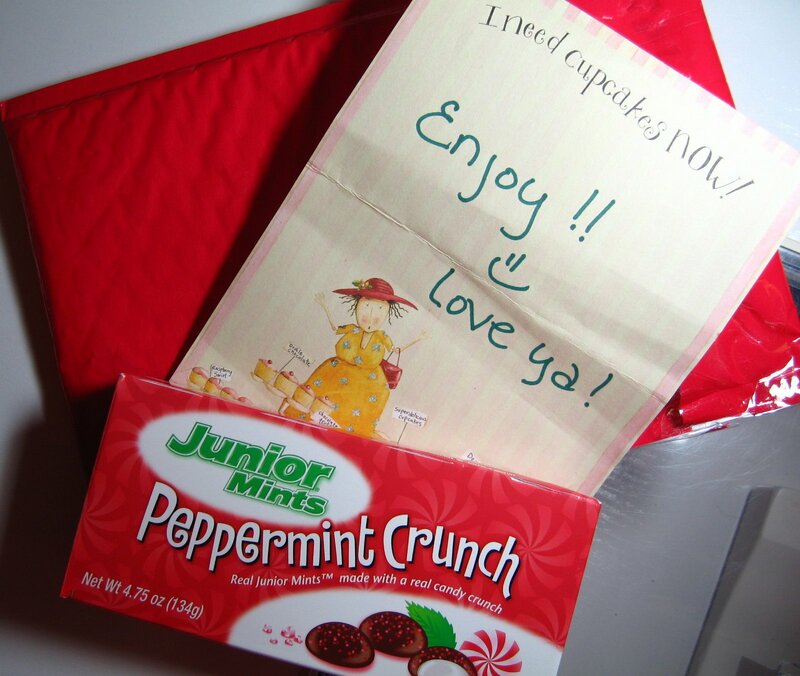 And the I-found-a-lovely-presentness of it. I swoon with delight in it. I'd roll on the floor over it but sadly I'm old and creaky feeling and might get stuck. Ok, so lets move on from that scary image. That sweet new little link over there on the right will take you to Holly's blog.. she's at it again with her clever ideas. I'm a tiny bit afraid since it's a signal that Christmas is really around the corner, even though our corner for Christmas is just filled with dog fur and thread at this point. And Anne, she's taking it to the next level for sure... she's the first little Bear for Christmas and she's got a sweet quilt and pin cushion and ornament and a pdf. A PDF I TELL YOU. 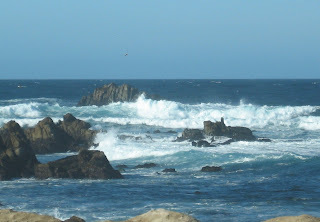 Visit these spots and be inspired! Oh Anne! Ok, off the mall my sweet sweet little friends. Wish me luck. Good Monday morning peoples, how are you today? Did you have a good weekend? We were busy bees but we're in complete denial about Christmas, we worked on all kinds of stuff this weekend, but still no tree! Bret and Frankie usually put up the tree but I don't think we'll see her before Christmas. I guess he's going to have to buck up and do it with me! In the meantime, I'm going to block all the stuff I need to do right out of my mind and show off my evolving pile of fabrics. Here's my little pile for the first block, the pears. 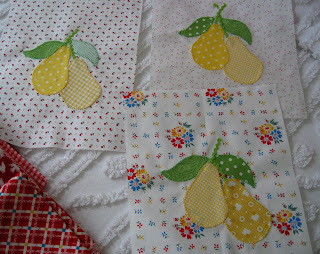 This quilt is making me so happy I wish I didn't have to go to work so I could sew on it. Who knows what kind of temptations are waiting for me there! Good morning dear readers! How are you today? It's been a rainy couple of days here but nothing like I've seen in the news! 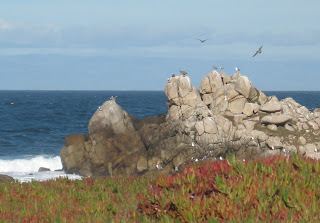 I've been reading the Daily Astorian to check on Monica. That was some storm they had up there. Hopefully she'll have power soon and can let us know. I'm thinking of you Monica!! Here's my latest project all lined up. 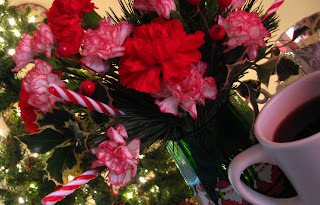 I got my pretty red floral border and my Katie Jump Rope greens from Jane's shop. I also got that cute Japanese background print there, third from the bottom of the lights! How sweet is that? 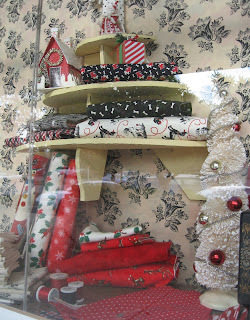 Jane has set aside the fabric for those interested, call or email her. Some of the new reds are from the shop. We have a nice selection there right now. The rest I've pulled out of my stash. 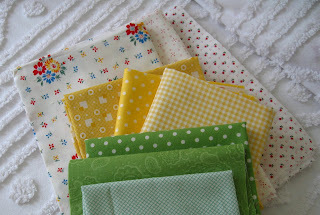 Has anyone else noticed how hard it is to find a good focus fabric lately? I've been looking for quite a while with this project in mind. I still need to pull some blacks for the birds, it's on my to do list. The project is Elizabeth's Flight of Fancy. It's a block of the month and I'll be honest, it's the first BOM I've tried and my first big applique project! I'm nervous and excited all at the same time. 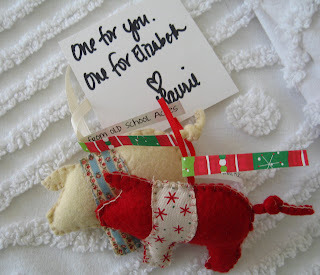 Elizabeth is offering free shipping for the next 7 days (12/7 to 12/14) if you mention PKM!! (retail orders) You can also find the pattern here and here. Anyone want to play along? That's it for this week my friends. I hope you have a great weekend!!! I had a groovy day, not only did I see a dog, I also caught an episode of Perry Mason, The Case of the Bigamist Spouse. I did some sewing and some arranging and some laundry. Talk about shocking. I must have seen a pack of dogs. .. I have to have two photos of it. Because I love it. 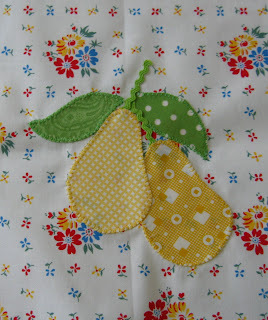 Since I bought that pear fabric I have been imagining a felt pear and it's even better than I thought. Pillows normally aren't my thing, too much figuring out stuff, but I just pulled out Elizabeth's book and her pillow construction instructions are very good. I even resisted the urge to call her and make her tell me how to do it. ( I could do it you know, I could MAKE her tell me.. just ask her.) But she'll appreciate me figuring it out more I think. The back is nice as well. I have a new love affair with covered buttons. Now I just need to have Holly send me some of her jumbo 2 inch buttons. Those buttons are something else! 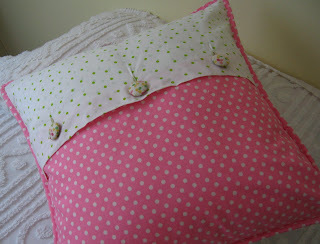 So I'm thrilled with pillow in case you're eyes have rolled so far back in your head you missed my ranting and raving. I'm thinking about some Japanese fabric I ordered from Kris. Now how cute will a pillow be with a fun little brown hedgehog on it be? Or a bag? 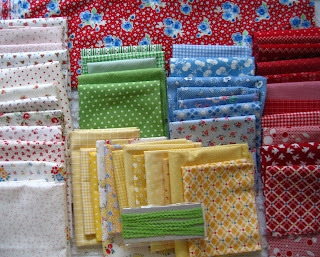 Crazy I know, but I'm totally inspired to make several fun projects now. And you know, that is just as good as seeing a dog. My favorite line from Elf. I happened to catch just a bit of the movie over the weekend and forgot how delightful it is. I want to bottle the sheer joy he's feeling because he saw a dog. I picked up my new APQ yesterday at the shop. 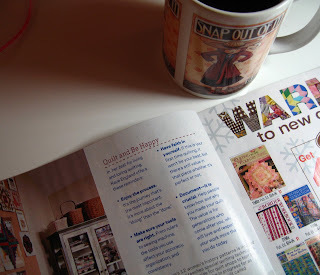 I was going through it last night and this page caught my eye, "Quilt and Be Happy". It's a nice article about Kaye England. 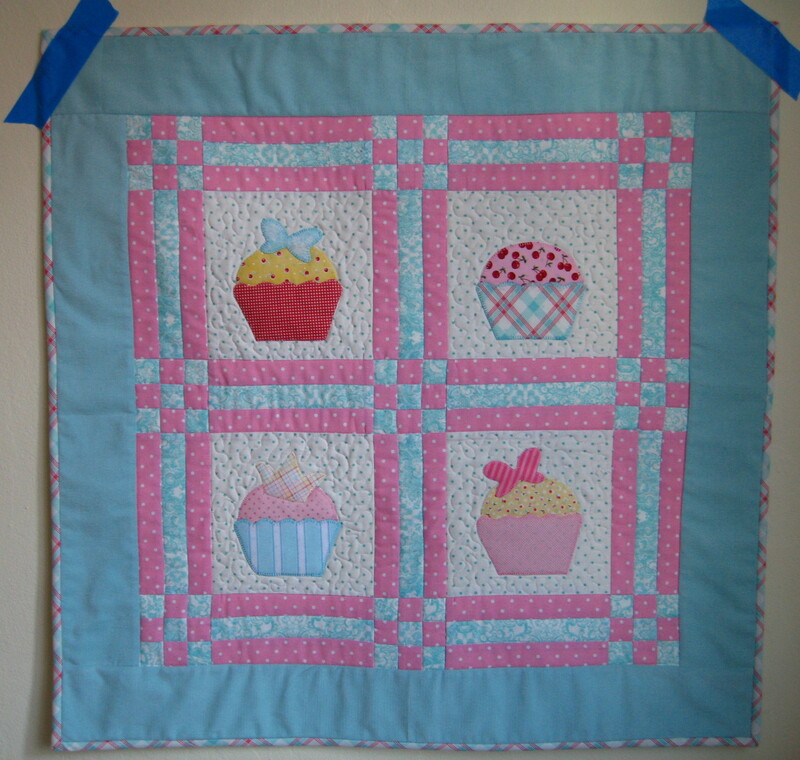 I should think about that more, quilt and be happy. 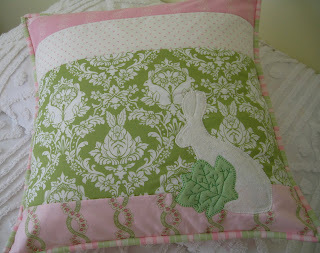 There's a wonderful antique quilt she shares with readers, along with a pattern. 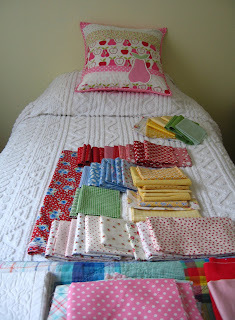 It's called Gone to Pieces and its a wonderful 9 patch quilt and I really think I'll make it. (or maybe just think about making it) I love the use of prints and solids. The quilt in the magazine is quilt large, but soon the instructions for smaller quilts will be on the website, allpeoplequilt.com. Not there yet. Here's a messy shot of my table. 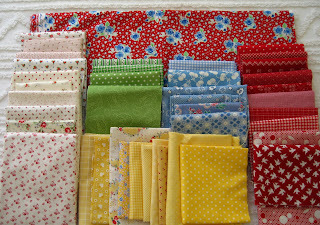 Rain rain rain today, so I think it's a perfect day to stay in and sew. Maybe even pick up and organize something. Or not. I just hope it will be a happy day, I've already seen a dog. ** p.s. 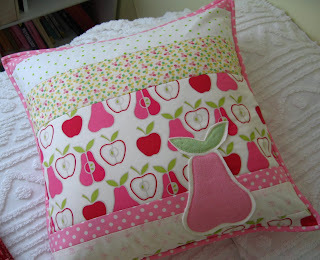 Camille is having a drawing for her one of her delightful new patterns.. check it out! Here it is. And just in case you thought that blue tape was some kind of special effect from photo shop.. it's not. It's just blue painter's tape. It does look a bit like I've given up all pretenses doesn't it? It feels like it. But here it is, in it's corduroy glory. Which corduroy, I don't recommend you. Those borders fit perfectly, no pulling and easing.. but they look like they're the first borders I ever put on. Still its cute enough and it will only be used under a little pink tree, so I'm not worrying it. Too much. I'd enjoy making this again, the cupcakes and butterflies are completely adorable. I'd use more colors and more embellishments. More stuff. 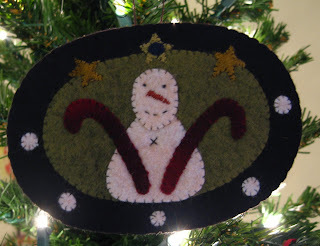 If you'd like to give it a try, Sandy is having a drawing for a free pattern, so head on over there and check it out. 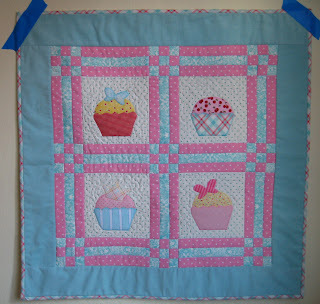 And if sewing isn't your game, check out Amy's little cupcake quilt drawing! So my friends I'm off to work this morning so see you later alligators! Sharon really knows how to make a girls day!